The highly popular Halloween Horror Nights in Universal Studios Singapore is back for the 3rd year running. Started in 2011 with only 1 haunted house and 5 scare zones. Last year, we saw record attendance, with tickets selling out on 4 of the 7 days. This year, HHN is back with for 10 days, and features 3 haunted houses and 3 scare zones, as well as a special show produced for Halloween. Details: The theme for this year's HHN 3 is the Evil Sisters, where 3 evil sisters unite to wreck havoc. The evil sisters are The Crone of the Forest, the Maiden of the Opera, and the Daughter of the Undead. The 3 haunted houses this year are: Adrift(A), Songs of Dead(B), and Possessions(C). The scare zones this year are: Forbidden Forest(F), Convention of Curses(E), and Attack of the Vampires(D). Resorts World Sentosa has really stepped up this year, and the design of HHN 3 is absolutely impressive. 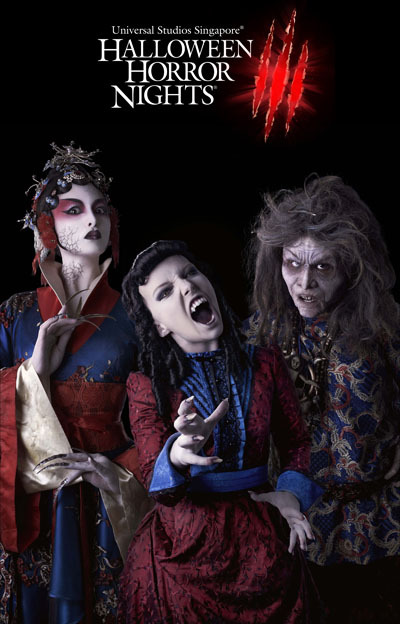 The icons for this year, the 3 evil sisters, are visually stunning, and have detailed, compelling backstories. Furthermore, we see a further integration of local elements into HHN, with the Maiden of the Opera. The presence of local horror was minimal for the past 2 years. The Vengeance of the Matriarch maze in 2011, although themed as a visit through a Peranakan mansion, was actually very generic, and did not highlight the local Asian elements. Last year, we had the Chinatown maze in the New York area. Again, it did not play up the Asian horror mythology. Therefore, I am very excited to see USS adopting the Chinese Opera singer as one of the event icons for this year, and I am looking forward to an emphasis on Asian horror. We see a increase in the number of mazes from 2 last year to 3 this year. I personally find it a very interesting choice to not theme all 3 haunted houses to the event icons. Instead, only the Maiden of the Opera has her own haunted house, while the rest of the icons are to be found in the scare zones. The other two haunted houses are themed to a ghost ship, and a possessed house. I think that there is great potential for Adrift to be a spectacular maze as it is housed in the soundstage. Furthermore, the theme of a ghost ship is also very interesting. I look forward to innovative special effects to simulate the motions of a ship, or the rain and lightning of a sea storm. The possessed house maze also sounds intriguing, as there is great potential to improve on the traditional haunted house experience. We see a reduction in the number of scare zones this year, from 5 in 2011, to 4 last year, and down to 3 this year. We also notice a rather curious decision by USS to not place any scare zone in the Hollywood section, which is the first land visitors enter upon entry, perhaps due to congestion issues? For the past two years, the Hollywood zone was home to Carn Evil, and House of Dolls, both of which were rather spectacular and well-done. The canopy above the Hollywood zone helped to contain the fog, hence making the area much more scary. The canopy overhead also also served as a rig for USS to hang theatrical lighting, as well as massive props above the guests. This year, we will see the New York zone of USS transform into a graveyard and a small town. It will be interesting to see how they pull this off. We also see the first time that the Lost World is used for a scare zone. The Lost World seems to be the perfect location for the Crone of the Forest scare zone, due to the dense foliage and meandering paths of the zone. However, the Lost World zone seems to be the location where all the action will take place this year, as there is the concentration of 2 haunted houses and a scare zone, as well as a ride. This small, cramped zone might not be able to handle to crowds. The scare zones located in the Ancient Egypt zone for the past 2 years were both major disappointments. In 2011, it was themed as the Edge of Darkness, though it rather seemed as the edge where the budget ended. In 2012, there wasn't a significant improvement with Bizarre Bazaar. The problem seemed to be with the physical setup of the Ancient Egypt zone. 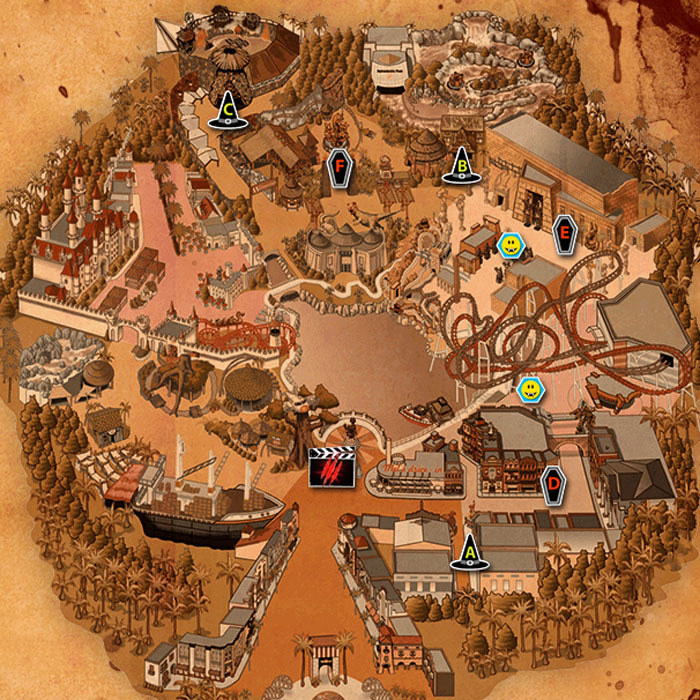 The zone is designed as a straight thoroughfare, dominated on one side by the Revenge of the Mummy facade, and on the other by the Treasures Hunters queue. The thoroughfare is very wide and hence is not a very ideal location for a scare zone. Therefore, it is very interesting to see how USS pulls this year's Convention of Curses off in the Ancient Egypt zone. I would also like to see USS utilizing Far Far Away and Madagascar for their scare zones, as these 2 lands have not yet been utilized.